Apeldoorn can be reached by train from Amersfoort, Deventer and Zutphen. Regional buses go from Zwolle and Arnhem. From the train station Apeldoorn there are local buses to the start at Victoria Boys. Bus 6: Station – Rijkskantoren – Orden – Station; Leave the bus at bus stop Paulus Potterstraat. 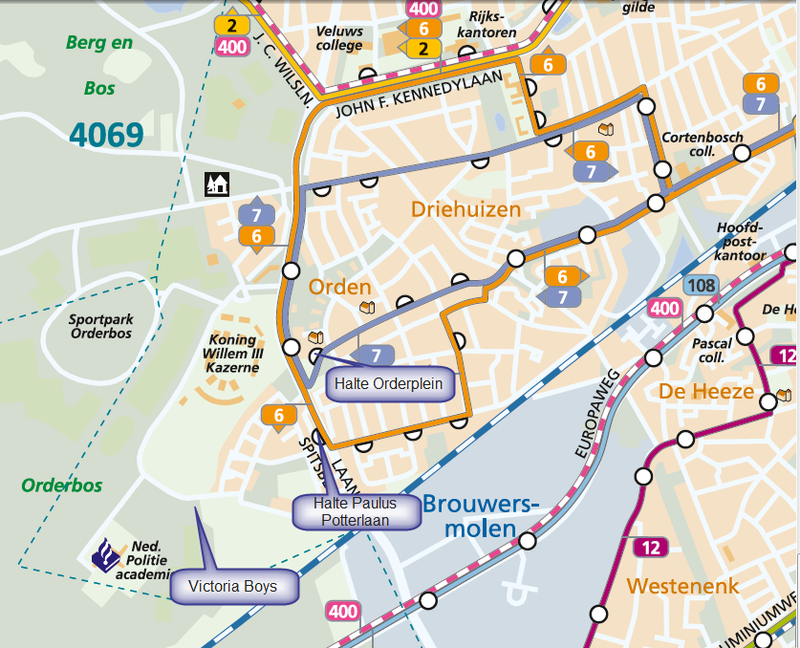 Bus 7: Station – Orden – Driehuizen – Station; Leave the bus at bus stop Orderplein. Take the A1 towards Apeldoorn. At the bottom of the exit, go right towards Apeldoorn (Europaweg). Take the A1 via the cloverleave interchange Beekbergen to Amersfoort. At the bottom of the exit, go left towards Apeldoorn (Europaweg). Follow the A1 in the direction of amersfoort. If you choose to use a Satnav system, drive towards the Sportlaan instead of the Berghuizerweg.